Almost 7,800 people registered to ride in Chonburi’s version of the royal Un Ai Rak Bike Event. Gov. 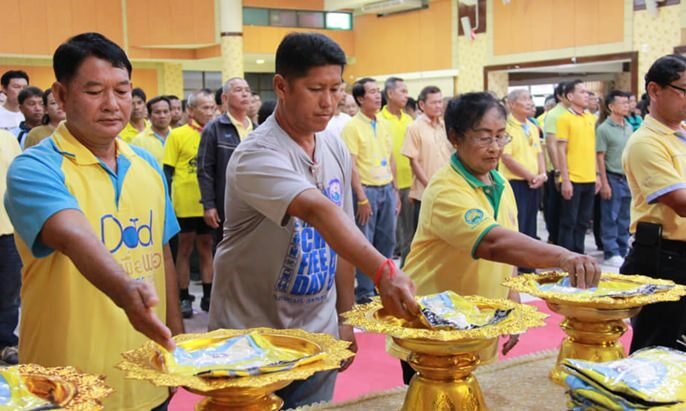 Pakarathorn Thienchai led the Dec. 6 ceremony to distribute blue shirts to all the registrants at the provincial hall. Patterned after the wildly successful 2015 “Bike for Dad” event to honor HM the late King Rama IX, the “Bike Warm Love” ride also was led in Bangkok by HM King Maha Vajira­longkorn Bodindradebayavarangkun. The nationwide event Dec. 9 was aimed at inspiring love and unity among all Thais. More than 200,000 people in 76 provinces registered for the event, with 7,790 coming from Chonburi, 57 percent of them men.